Like scorching napalm, bursting out of the nuzzle of a lethal flame thrower, the words let loose from the lips of Pastor DK Olukoya. ‘Christmas is demonic,’ he claimed, hence his refusal to celebrate it. The General overseer of the Mountain of Fire Ministries (MFM), one of the biggest churches in Nigeria, revealed that he doesn’t celebrate Christmas because its demonic, and it’s a tradition that his church members do not celebrate it. “In Mountain of Fire, we don’t celebrate Christmas because the root is demonic,” he claimed. This served as a big shocker to millions of Nigerian Christians who always eager to celebrate the yearly festivity. Your comment..still confuse….how is it demonic? Why did you state that,death awaits him what about you? Are then awaiting death? Asaa why did you say death awaits him? Are u out of your mind? Besides, make a research on YouTube and see the origin of Christmas. The problems we are facing in this country is that when the truth is said,the ignorant ones will surely rebuff it..pls let us wise up nothing like celebrating Christmas, cos christ didn’t mention in his preachings that we should give him a date, rather his preachings and gospels were to worship and believe in Almighty God..
You said it all, thanks may Almighty God fortify you with more knowledge.. There will surely be hypocrite, but the lenient will learn and follow the rightful choice and preachings.. Your comment..that is true. every Christmas time is always filled with atrocities and evil. Your comment..yes! that is true. Your comment There is one thing that always baffled me. Why is it that instead of Christians or all these so call pastors teaching us fact from d Bible they keep on arguing nonsense things. Does it mean that we r having different faces of Christianities in this wicked world. Mr. Odukoya who is d founder of Christianity n whose person’s birthday r we celebrating in Christmas? We become slaves to our beliefs. We have the power to condemn and exalt. But only God imputes sin. What we do at Christmas defines us not the celebration..
it could be truth. I remember some years about 3 to 4 years ago Pastor W.F Kumuyi said some thing similar. him said Christmas is a period of the celebrating the gods of the sun. Xmas is demonic? How ? Why? When? Where? Is it that, they make sacrifice to the devil? Is it that hatred is prevalent during this period? Is it that a name other than the name of Jesus is called during Xmas? I believe this is a sham! How come? The authenticity of this is 100% in doubt. let me explain to him if he don’t know the history of ancient Christian story. during the reign emperor the Jewish then were celebrating the feast of sun god which make the Christian then follow them, the then pope find out the peragan feast Christian dominant the Christian and fix the birth of Jesus Christ that day they were feast of sun god. is it the celebration demonic or the way u celebrate it that matter. b4 I think Xmas is the time we drink and have different kind of on godly fone.but when I listen to the message of a man of God about Xmas I find out that the way I celebrate it was wrong. I will refer Dr Olukoye to Romance 12vs21. The Christians have overcome evil with good. Christmas is one of the triumphs of light over darkness. Nigerian preachers should be Careful what they say in public because even the simple biblical questions they can’t answer. Now let me ask Dr Olukoya, Why do you go to Church and worship on SUNDAY and encouraged your church members to do so? pls answer. Your comment.. I am totally disagreed with the pastor and tour comments, Lord forgive me if what am about to say is sin because the pastor himself didn’t sure of what he is saying, because what he also quoted there wasn’t recorded in the bible, so let’s just be careful of what we quote with the bible. Chimezie Isaac Ezeonye. Sincerely, I feel disappointed that one of my fathers in the Lord could say this. I understand that early Christians instituted the celebration of the birth of Jesus Christ on the said date as a way to ensure the Christians were not enticed by the flamboyance of the idle worshippers. I’m sure it is clear that Christmas is the most recognized celebration on this planet right now, how then can you call one of the strongest soul winning tool demonic. Do you know how many people have become Christians because of the Christmas solemn assemblies? Apostle Peter warned that ravenous wolves will bring in heresies by which they will bring swift destruction upon themselves, and that is happening already. do we now condemn the entire Christianity because of them? if celebrating Xmas is so demonic, why are you worshipping on Sunday? I’m sure you also know that the old Sabbath that God told Israel about is a Saturday. isn’t worshipping on Sunday demonic? I heard people broke their televisions sometimes ago just to be good Christians, now you are watched on television, is it demonic also. Christ never preached on TV but you are preaching on TV. you are watched worldwide simultaneously as preach from Nigeria, don’t you think it amounts to associating with demons if we go by the saying that all the mechanism was demonic invention. I am not surprised, I ask him where in the Bible do we see the word Sunday yet his members do worship on Sundays and that is not demonic to him let me remind him Sundays are the days Pagans worship their sun god. So let the founder of M. F. M tell his members to stop worshiping on Sundays, leave Sundays for Christians after all they do not celebrate the death and Resurrection of our Lord Jesus with us trie Christians. Well the Antichrist are already manifesting. God knows His sheep and His sheep knew Him. Praise the Lord. If Christmas is demonic how much more will Christianity be demonic too. Who called you Christians? God or gentiles, men or Spirits? Thanks to God for Christ’s sake. Please watch what you say. Hmmm! I really need too see my father in the lord about this.I noticed that, its only in the christiandom that we have more than 100 blvs under one father.. Daddy odukoya please sire can we get more knowledge on this? Cos we are confused. Evil or no Evil ..Demonic or not demonic,Once I’m alive I’ll celebrate Xmas.we shall know better when we get to heaven. Your comment..Neither Jesus Christ nor His apostles celebrated Christ’s birthday (Christmas) in the Bible. A Christian’s Christmas (birthday) is the day he repents from his sins and puts his faith on Christ Jesus. The day he becomes free from presumptuous sin and eternal damnation. See they won’t see. Someone telling true some call him demon. Internet has made everything easy. Google the origin of Christmas you will see that Christmas has nothing to do with christianity. Your comment..I totally disagree with the pastor. like mature said Christmas is a triumph of light over darkness. the roman were indirectly worshipping God because he is the creator of the sun and everything in the universe.God is the almighty besides him there is nothing like gods or goddesses.you remember to celebrate your birthday and u don’t borther to check if the day was used to honour a deity in ur village, but when its time to remember to celebrate the birth of the king of the universe, you remember it was a day to honour the sun god. the sun god and God who is greater? even if others celebrate the sun god, you as a Christian when do u celebrate your own God? or you dont think God deserves to be celebrated. you are not a christian if you do not celebrate christmas. if u like go and argue with your ancestors. you simply dont love God. Your comment.A true Christian is one who believes in Christ and loves to partake in his memorial; birth(life), death and resurrection.The most important thing in Christmas is that we celebrate Christ who is the light of the world. He is more important than anything we think because the very essence of our existence is to love God and serve him in whatever way we can think. Christians should stop crucifying christ by arguing on things related to him. God is almighty, besides him theres no other. He is maker of all things visible and invisible. He owns us and everything we have.He is owner of all days of the week.Muslims for example don’t argue over Mohammed and on their salah day, they must celebrste it irrespective of what is happening.they dont care if its the day christian do theres. Your comment..sometime,i don’t rely understand the Christians.they Complicate the believe.they are so confusing, making things difficult for their followers.ministry with different way of preaching. which is wrong.which one is the right church or the preaching, you don’t know. Your comment..brethren, it is important to understand the scripture before you criticize, Xmas and Sunday worship are two different things. Xmas should never mentioned let alone be celebrated Christians. what do you mean by Christ-mas,according to the teachings of the Catholic mas is the continuation of the sacrifice of Christ on the cross,how can one continue the sacrifice that the high priest of our profession has done once for all.on which he established the new covenant. This is what the Bible calls “the abomination that maketh desolation in the book of Daniel.The Emperor that introduced Xmas was never a Christian, unfortunately, the marriage of the church and the state popularized it.As for the Sunday worship,it is the declaration of Sundays as an official resting day by the Roman authority those days and the fact that our master Jesus Christ resurrected on Sunday that brought about it.pls Xmas is not for Christians. Paganism and demonicity has taken over the world. Our calendar is for pagans. The months of the year are named after Greek and Roman gods. God bless d Pst of MFM. Believe it or not datz jst d truth. Nothing like Christmas in d Bible, Constantine of Rome n d leaders den did all dis. marrying of Christianity n Peganism. Sunday worship is don bcus Christ rose up dat day. datz y people goes to Church on Sunday. God bless u Pst. Your comment..abeg help me ask him where crusade is in the bible, ask him also where d word bible is in the bible, ask him also where Jesus instructed that tithes be collected? ask him also where christ founded a ministry? I don’t blame him, he has a shallow understanding of the scriptures and early church history. self acclaimed deceivers! He has right to deceive his gullible listeners. He needs to ask questions for clarification. This is laughable that a preacher like Olukoya could come out to say this. Well, maybe he has been using some of this his low minded thoughts to lead his followers. But I am quite convinced that Jehovah is the definition of Wisdom. It is out of God’s wisdom that he hardened the heart of pharo to destroy him Thus I still believe that it is out of God’s wisdom that he has caused Olukoya to say this to the hearing of you and I, so that people like you and I will say a lot of all that has been commented so far from different minds and reasonings, so that those who are been mis-led by all this appauling teachings will read to know and follow reality. God bless you all in this season of joyful celebration. May God almighty forgive u,u that called yourself a pastor.this is what we called end time,many people will call themselves Jesus,prophet,let me ask you, what do you know about Christ? Listen to me bible is not a book that can read and understand it once, if Christmas is none of your business then go to hell, live it for us that know the important, for me I’ll celebrate it till I die, my people don’t allow anybody 2 deceive you, trust nobody but God almighty, I pray for wisdom, may God give us wisdom to know them by their fruits. That’s a false comment from D.K Olukoya. It can’t be. The truth is that most Modern doctrine of Christianity are tainted with Idolatry and the earlier they’re discarded the better. e.g the name easter was if idolatry origin, it signifies east(sun) worship. Also Trinity was not believed by the early Church, rather the early church until 331 council of Nicea believed in Unitarianism. Trinity, Easter and Christmas were all Roman paganism brought/mixed with Christianity at 331 council of Nicea. These pastors are just telling their prey what ever they like. Thank God, those pastors who told their members not to wear LACE then are bowing wearing correct LACE. & they are using now using WORTHILY THINGS. As long as I live, by God’s Grace, I will always remember d day my SAVIOUR was born. Your comment..I am in total agreement with the pastor. Christians should not celebrate Xmas because it is a human doctrine. And the date did not corresponding with the actual dates of Jesus birth. Since knowing when Jesus was born why should someone set a different date for us and we agreed to follow him. Furthermore, worshipping on Sunday goes against God commandments. God himself set the seventh day and even Jesus worshiped on the seventh day why should we change because of human convenience? When humans decisions goes against God’s plan we are under obligation to question it, refuse it and reject it. Your comment..Am in total agreement with pastor mfm and d comment made by Boss,The earlier we discard human traditions (Christmas,Easter & Sunday worship)as Christians the better for us.If you are in doubt why not go to any library of ur choice,take up any encyclopedia and read up for urself the history of Xmas, Easter and Sunday worship. Compare with ur Bible, then make ur judgement. how can he say Christmas is a festival of demons.This pastor is an Antichrist minister for saying such thing. Christmas is a day set aside for Christians to celebrate the birth of Jesus. 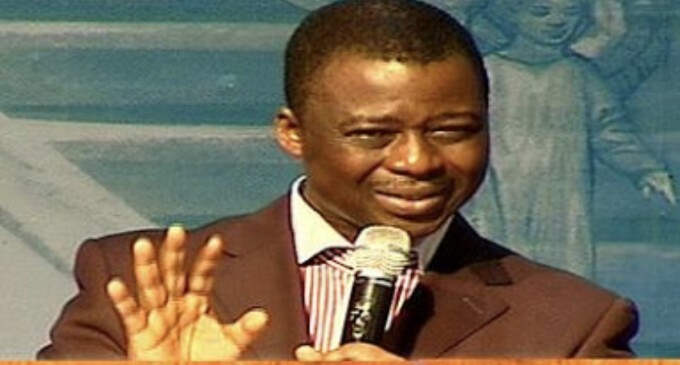 This pastor olukoya is trying to dispute the fact that Jesus was never born into this world,only an Antichrist will say such thing,he is leading people astray with false and bad doctrines not from God. According to 1john2:2-3 anyone that does not acknowledge that Jesus came into this world as a human being is not of God but of the Antichrist. We must celebrate Christmas because Jesus was born,if the angels were celebrating his birth by singing and glorifying God, why should we Christians called by Christ not celebrate his birth. we must celebrate the birth of our lord Jesus who brought hope into this world, he redeemed us to God. Pastors should not ridicule themselves because of the knowledge of man that has blinded their eyes to see the truth about who God has sent to deliver us from all unrighteousness and from sins. He is Eternal we should celebrate his birthday. I agree with him. Christian is not a religion because Christ was not known as Christian. The name was given to you by pagans in ANTIOCH. Christmas is also a pagan festive because Jesus Christ and his disciples were not celebrated his birthday and bible doesn’t teach anything of such then, where do you see this? Beware, Jesus Christ will tell you on that day “move away from me you sinner” because he didn’t know anyone of u as a Christian. Repent now, tomorrow might be late for you. The only religion acceptable by God almighty is AL-ISLAM. Just look around the globe. People are reverting to ISLAM in country like America, England, Canada, Germany, Spain and here in Nigeria.